This is my last planned Oktoberfest tasting of the current season. Tasted non blind on October 31, 2012. Served from 12 oz bottle. Copper color in the glass, clear looking throughout with a short, fairly quick head. Nose of mahogany, toffee and malt. Flavors of toffee, malt and a hint of sorghum. Clean and fairly refreshing on the palate with good weight and a medium finish. Good to very good. Let’s call this one three and a half stars out of five. 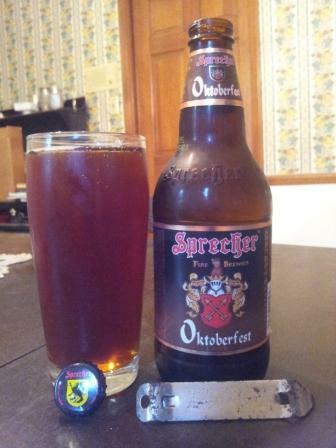 This style of beer originated in Munich to celebrate the annual German Oktoberfest. In the old days before refrigeration, beer was brewed from the time of the barley harvest until the first warm month, March. When the harvest came again, any of ‘last years’ beer was consumed before the first new batches were ready. The event officially became known as Oktoberfest in the the early 1800’s. The style of this beer is balance between the desires to have a drinkable beer, and one that is strong enough to survive the long summer months in the cellar. Today we have modern refrigeration, but we still make this beer several months before the harvest so it can age properly. 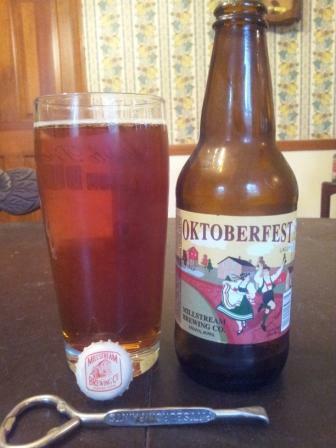 Millstream’s Oktoberfest is similar to the our Munich style Schild Brau Amber, but it has more flavor, is maltier, and darker in color. A truly special beer, to celebrate the harvest, an important part of life here in Amana. 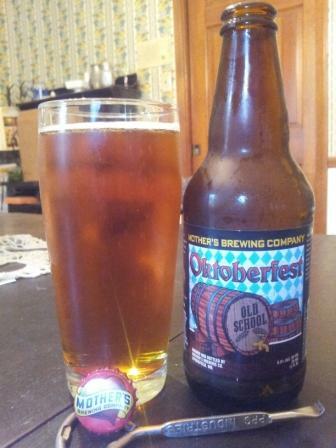 Join us for the Amana Colonies Oktoberfest and partake of a pint yourself! 2 Row Brewers Malt, Bonlander, Munich 20L, Caramel 60L, White Wheat. Tasted non blind on October 14, 2012. Served from 12 oz can. Pitch black with a nice, fairly retentive head. Nose of…well…java…as in espresso, cocoa and maybe a touch of smoke or perhaps some bitter chocolate. 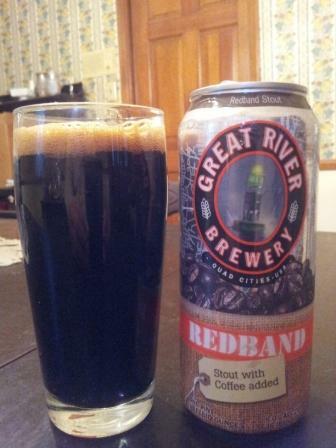 Flavors of coffee, chocolate covered coffee beans and a dash of a spicy almost ginger like finish. Good weight and presence on the palate. Very good. Let’s call this one four out of five stars. This is the kind of beer that gives the word “stout” a reputation. Extra generous quantities of barley malt, followed by vigorous fermentation leaves this “imperial” heavy weight with 8% alcohol A.B.V. and a body as full as chocolate bread pudding. A complimentary and complex array of bitter notes comes form potent American hops, earthy British hops, black-roasted malts and, of course, coffee. Santa Fe Brewing Company uses only top-quality ingredients like organically grown East Timor coffee beans blended with New Guinea coffee beans, locally roasted by O’hori’s Coffee House. 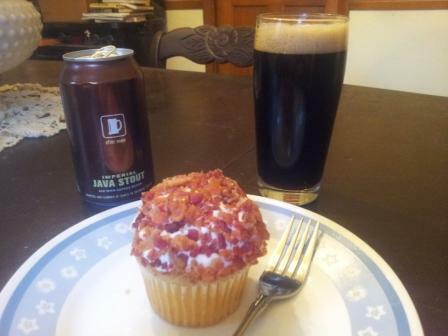 Its heavenly flavor and aroma can’t be beat or imitated. Tasted non blind on October 7, 2012. Served from 12 oz bottle. 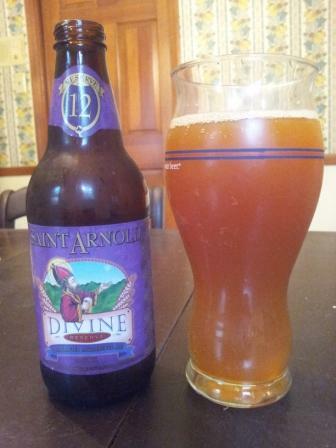 The Saint Arnold Divine Reserve 12 is an Old Ale style of brew that comes in at a fairly hefty 10% ABV. It was released during July 2012 and has been cellared since at 52 degrees until opened for this tasting. Served at approximately 50 degrees and allowed to warm slowly in glass over the next 30 minutes. Burnt orange color in the glass, pretty opaque looking top to bottom (note that I did not stand or decant this bottle prior to serving as recommended by Saint Arnold) with no appreciable head. Nose of orange spritz, apricot core, floral notes and a bit of a sorghum/molasses kind of aroma popping up last. Flavors of apricot, orange peel and spices framed over an earthy finish. Good weight with a little bit of a muddled, medium length finish. Good to perhaps very good. Let’s call this one three and a half stars out of five. This beer was inspired by David Rogers’ winning entry in the 2011 Big Batch Brew Bash homebrew competition. The color is orangy amber with a light, creamy head. The nose has rich malt notes and a little alcohol that combines with a spicy hop note to create a complex bouquet. 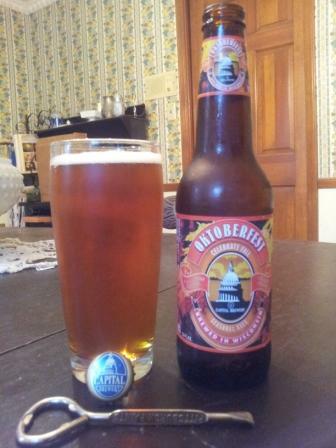 The taste has a spicy, malty beginning that smoothes out into a creamy middle and a warming finish. While this beer is enjoyable now, it is designed to be aged and will shine after a year or more in the bottle. This will allow sherry flavors to develop as the alcohol oxidizes. It is also important to allow this beer to warm up so that all of the flavors emerge and round out the high alcohol level. We did not filter this beer. When pouring we recommend decanting it, carefully pouring the first 10 or 11 ounces without allowing the sediment to enter the glass. If you want, you can pour the bottom of the bottle into a separate glass, but you will discover that the decanted beer is a little brighter in flavor.